Enjoy Hilton Head Island while staying in our oceanview condominium. It is located on the top floor(3rd) of the building. The ocean can be seen while sitting on the couch or while standing out on the balcony. Our unit is fully furnished, and ready for your vacation pleasure. Our condominium sleeps four to five people comfortably. Newly renovated in December 2016. Granite countertop, new cabinets and new appliances. A complete kitchen is available, should you decide to cook in. Or... you can enjoy many of the fine restaurants that are just minutes away. We have voice mail in our unit. 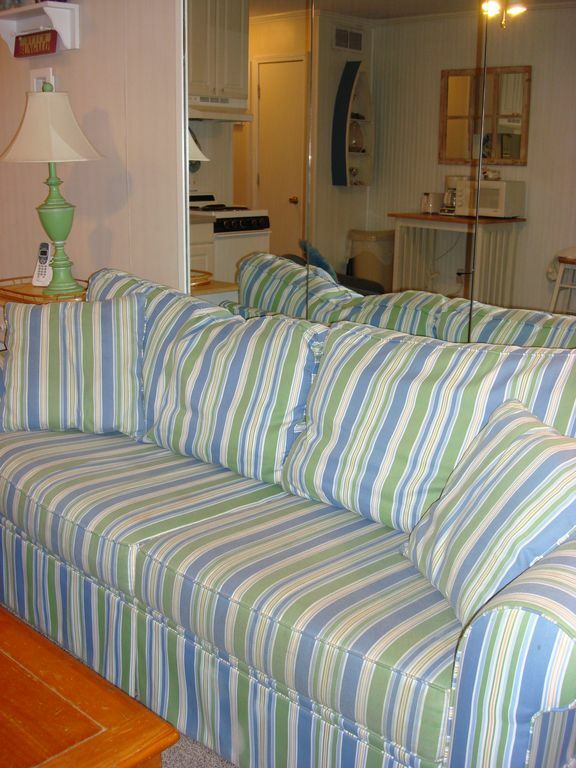 This condominium is located in the Hilton Head Beach & Tennis Resort. The resort is family-oriented, and is located between Palmetto Dunes and Port Royal Plantation. There are ten tennis courts available while you stay there. There is a beach side lounge next to walkway to the ocean. There are two pools on-site, one of which is the largest on the island. The resort offers roller blade and bike rentals. Is close to outlet malls, restaurants, and many other fun activities. The resort also has 24-hour security. So come and enjoy a week in the sun, play golf, tennis, or just relax on the white-sandy beach. There is also a coin operated washer/dryer in the building. Please note the master bedroom and the bathroom have recently been remodeled. New flat-screen in the front room. Just the relaxing time I have every time I am there. There is something about the water that just takes all your cares away. You can sit on the balcony or on the couch and see the ocean. Beautiful view. Central to everything on the island. Simple condo w/all the necessities. Nice cozy place. Great sunrises from deck. Had a great time, middle of building B third floor. Very clean. Wonderful, clean with a great view. The only downside was that there was no oven (it did a stove top) and we had bought frozen pizzas for dinner. We will be prepared for that the next time we stay here. The home was much better than anticipated and the view was awesome. Will go back again, and the owner was very generous in providing a beautiful place for us to stay. The accomidations were first rate. There is a credit card fee of 3%. Ask about our snowbird special for Jan & Feb. great monthly rental rates. Do not make any payments to VRBO. I do not use their system. You will need to make direct payments to me.